November. 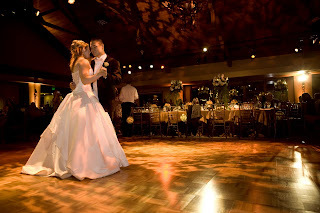 I had the pleasure of working with Kendra and her team from Pfeiffer Event Planning on this memorable event. Even with the hard work wedding planners do in preparing every part of the day and timeline, I still double and triple check everything before getting started. Before announcing or introducing the toast we always check with the planned “toasters”, which usually consists of the Best Man, Maid/Matron of Honor and in most cases, the Father of the Bride. When I confirmed with Sofia’s father he immediatly asked if I could play the song It’s So Hard to Say Goodbye in the background as soon as he started his story. Not knowing the details of the speech I was ready to go and brought it up just as Dad mentioned the story of the High School dance. It was truely one of the most genuine and real toasts I have heard in some time and the entire room, after a small chuckle when Dad called them “THE Boys to Men”, was engulfed in emotion. These are the moments that make weddings spectacular and unique!!! As good of a toast as it was, without the music in the background the emotion in the room would not have been the same. Here is the toast…. Toasts from Reel to Real Video on Vimeo. Special thanks to Cael and Deana Kuhlman from Reel to Reel Productions for the video of this special moment at the beautiful Viaggio Winery. I can’t believe 2011 is already 12 days old. The phones are ringing and the emails are coming in. Apparently people are still getting married and companies are still throwing parties 🙂 The Bridal Expo at Cal Expo last week was a huge success for us. We spoke with over 300 brides and grooms. This was out first time in that particular show and it was a great success. Several events booked at the show and a few more have booked this week following the show. If you are looking at our website for the first time, thanks for checking in. If you are just poking around and checking in… Ihope you are enjoying a fresh new start to the new year! I’ve been working on gathering videos and pictures from the past year’s weddings to blog about so I’m hoping to get that going any day now. Smile at someone today… it might make their day! Talk soon…..
What a great year it’s been for Music & More Entertainment! The busy wedding season is just starting to wind down and we have had an amazing and successful wedding season. Business is up 70% this year, and more importantly our after event evaluations are coming back better than ever! As we have more time to catch our breath this month, look for more and more blogs coming up with some of the great stories and pictures from this past year’s weddings. Also for the first time ever, you can read about not one, but two, of our great weddings in Real Weddings Magazine, hitting the shelf this weekend. More on that soon. So, keep checking back and I promise you some great posts worth reading and some beautiful pictures to boot. Talk soon…. It was a great wedding season this year and I’m going to go back and post some fun blogs from recent weddings in the coming weeks. But it’s full steam ahead for 2010. So far, its looking busier that ever. I have had a fairly steady string of calls in the last two weeks and several consultations. I think the 2009 wedding slowdown might be over!!! I’m often asked the question, how far out should we book a DJ/MC for our event. Most Wedding Coordinators, web sites, and magazines say it’s somewhere between 5 months and 9 months out. However, the real answer does vary depending on who you are considering. looking for, and he or she is a sole operator, book them as soon as possible, perhaps even on the spot. Trust your first impression. Trust the references you are given. Most importantly, trust that sixth sense that often helps you make a good decision on something so important. If you are not sure and want to see what someone else has to offer go ahead and meet with the other DJ/MC. Just remember that you are not guaranteed that your DJ/MC will be available when you finally make a decision. If you are not picky as to your exact DJ/MC and are planning on choosing from a company, its a little different. You may be able to find a company that sells you on the DJ/MC that you are looking for within a few months. But again, if you find a company that you trust and have good references from, don’t delay. With Music and More Entertainment, it is not out of the ordinary to book over a year in advance. Most of my clients on the most popular Saturdays book around 8-9 months out. However, there are many instances that i have a day open just a few weeks out. Especially in 2009, the year of last minute bookings. So bottom line… if you find someone you like, get them locked in. There is nothing worse than the feeling that you let the good one get away. 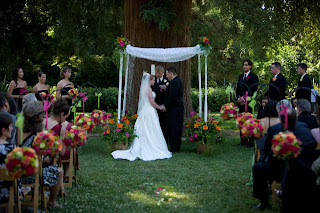 Call us today at 916.601.4107 and get on the books for an exciting 2010 wedding and event season. You won’t be disappointed!